Before you buy anything, it is important to shop around so you have an idea if you're paying a reasonable price of the items. I usually read reviews, recommendations and through word of mouth. Anything in cars hubby is the one who taking care of it, from accessories, repair and maintenance, and etc. Oh! geez, I don't know what should I do if something wrong in my car that's why he purchase a brand new car for me enable to have a reliable car considering I don't know anything about in car. Hubby likes to tinker even though the car is brand new and usually he shop all of the accessories online since he has no time to go in the Mall. Seat Covers-We think having a seat covers is important especially we have a toddler so it is easy to clean up. All-Weather Floor Mats-leaving in 4 seasons we make sure that we're enable to protect our vehicle floor from snow, mud,sand, rain and , kid's crumbs. Garage Car Lift-hubby likes to maintain our own vehicle. Car Sun Shades- is one of the accessories a must enable to protect you and your car's interior against the sun's heat. Car trash bin-I like my car clean so hubby bought one and it is easy to clean. Back Seat Organizer-you could hang behind the seat and put some toys,books and etc. 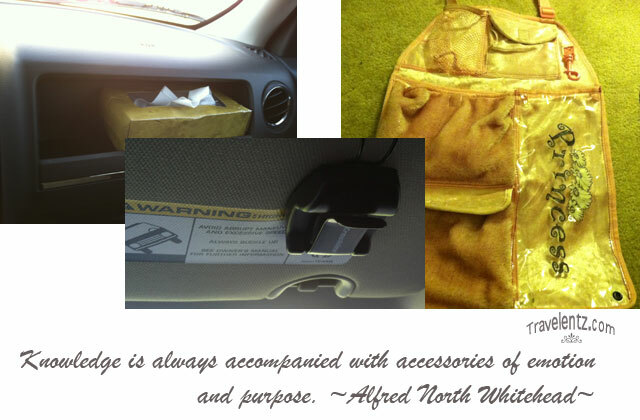 Car Organizer- Hubby and I love to organize so we have one for sunglasses, mobile phone, GPS holder,and etc. Trunk Organizer- I love to maximize the space in our trunk so for me it is important to have one. Tire Gauge-as you know we love to travel and my car is our family car as well. Safety is important for us that's why we have one in our car to check tire inflation incase something may occur. I'm just thankful hubby likes to tinker and check things for me especially my car. I badly need a car trash organizer, my kids are messy sigh.. I leave the car cleaning/washing to my husband hehehe. same here, Mhie, hubby does the tough job of taking good care of our cars, well, the most that I could help is clean up the windows, haha!! Gosh, my wife will totally agrees with your comments ladies.. I am Mr.clean for nothing. When it comes to car, hubby is in-charge. He just ask for my opinion but at the end of the day, he will decide for whatever he needs for the car. oh my, i don't have all these because I don't have car... hehehe... well, probably in the near future, we will have a family car and for sure, I will make it like our home, with all these car accessories you've mentioned.